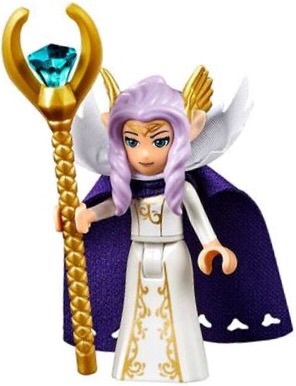 41078 Skyra's Mysterious Sky Castle is an Elves set first released on June 1, 2015 in Europe, Asia and Austriala and on August 1 in North America. It includes Emily, Golden Glow, Naida, Nascha, and Skyra. Also included is an entrance, a dining area and the castle itself. The large castle includes a spa room, lava kitchen, Skyra's throne room, Skyra's study and an opening portal. 2.1 In "Unite The Magic"
The dining area features four stools and a table. Each stool has a medium lilac bottom and a warm gold top. The table has warm gold cylinder legs with a transparent green stud on top. Each of the legs are connected to the one opposite, by a dark brown arch. The top of the table is a reddish brown plate and there is a strawberry smoothie on each end. The main section of the entrance is built on two curved bright yellowish green plates. Two light stone grey plates on the green plates, one small cylinder plate and a large rectangular plate build up the front pillars. The entrance has bright yellowish green ivy with bright purple flowers on it. The ivy can be turned to reveal the entrance. Each strand of ivy is connected to a reddish brown brick with a stud which is over the front pillars. Over each of the reddish brown bricks two warm gold cylinder pieces sit, leading up to a brick yellow arch. To the side of both brown bricks, is a large medium lilac pillar. Behind each of the brown bricks is a hinge piece. Each of the hinge pieces connect to a side of the entrance. The left side features a reddish brown, arched shaped apple tree over two medium stone grey slope pieces. The apple tree has bright purple leaves with a transparent pink jewel and single apple growing out of it. The right side features a small waterfall created by curved bricks coming out and falling over medium and light stone grey slope pieces. Over the pieces are multiple brick yellow 1x2 bricks, which lead up to a bright yellowish green 1x3 "L" shaped plate which connects the brick yellow pieces to the pillars. The brick yellow prices continue to be built up, but this time as 1x1 bricks. There is a medium stone grey arch piece towards the centre of the pieces. The two arches are connected by slope, angled, light stone grey pieces. A light stone grey sign sits in the middle of the arches with a bright yellowish green printed 2x2 tile displaying the earth element. Behind the sign there is a 1x2 transparent bright bluish-violet brick. The roof is built over the sign and it is lavender, curved, and angled with a medium lilac bottom. The castle is built up of three main sections. The kitchen and throne room to the left, the hallway and portal in the centre, and the spa and study to the right. The hallway is built upon light stone grey bricks which are slopes toward the front. Amongst the brick yellow pieces are white horizontal snap bricks, which allow the sections be put together. Apart from the 1x2 white bricks with studs on the side, the rest of the hallway's exterior is brick yellow with a bright yellowish green trim. The top of the hallway is arched. At the front two curved slope pieces with white stickers are on display. The inside features a vase with flowers on a light stone grey curved piece, acting as a rug. To the left is a picture of Skyra and her sister, Emily's Grandmother on a bright reddish violet 2x4 brick, which is connected to the white brick that has studs on its side. To the right of the hallway there is a spa. The front of the spa has medium azure curved plates and the spa itself is built on a sand yellow baseplate. The bottom of the spa has light stone grey bricks that are sloped to the side. The back of the spa is built up, it is mainly brick yellow but with a bright yellowish green trim in the centre. On each side, two brick yellow arches face towards the spa. Part of the back wall is open revealing a curved lavender fence with bottles of perfumes over it. Two aqua 2x2 curved plates with floral stickers sit on the floor, below the fence. To the right of the aqua bricks, there is a transparent bowl with fruits in it. Across from the bowl of fruit, is a light purple bar of soap. There is a sliding 1x2x5 transparent light blue brick buried amongst medium stone grey slope pieces, a brick yellow arch and medium lilac pillars at the front. Infront of the sliding brick, is a sticker of the froth of the waterfall on a 2x4 medium azure plate. Lily pads and bright reddish violet flowers are found on the front plates as well. To the left side of the back wall, there are white pieces with a hollow hole for the horizontal snap bricks, which connects the spa to the hallway. To the left of the hallway there is a lava kitchen. Like the spa, the bulk of it is built on a sand yellow plate. The back's right half of the kitchen is mirrored to the left half of the spa. Instead of a fence at the back it is a transparent bright orange 1x2x5 brick. 1x2 brick yellow bricks with a bright yellowish green trim occupy the right side. There is a medium lilac pillar in front of the bricks. An oven sits in front of the transparent orange 1x2x5. The oven is mainly black but has a warm gold door. Two 1x2 flat transparent bricks make up the inside. The top of the oven features a black jumper brick with a transparent orange plate to each side. On the jumper plate, there are cookies on a warm gold brick. On the floor in front of the oven, is a sticker of lava amongst rocks on a 4x4 flame yellowish orange plate. The flame yellowish orange plate connects the sand yellow plate to flame yellowish orange curved plates. The right side has a medium lilac pillar on a slope and transparent pink crystal. A light stone grey 2x2 brick lays in between the curved plates. The left end has a bright reddish violet spiral staircase which leads up to the second floor. The room above the lava kitchen is Skyra's throne room. It is built upon a brick yellow base plate. The throne is built in the back centre. It has a large reddish violet plate acting as a seat. Behind the seat, a transparent brick with studs on the side connects to a transparent bright bluish violet 1x1 brick with a transparent slope at the end. This build acts as the arms of the throne. On top of each of the transparent bricks, another 1x1 transparent bright bluish violet brick is on top with transparent slope above it This time they act as the back of the chair. A transparent 1x2x5 brick with a sticker occupies the space between the backs of the chair. The throne has a 1x2x5 brick yellow piece around it, on each side. Light stone grey angled pieces are around the 1x2x5 pieces as well. At the end of the light stone grey pieces are warm gold pillars with a brick yellow arch on top. A brick yellow 2x2 printed brick with the fire emblem sits over the arch. Above the arch is a 1x2 brick yellow brick. The roof is lavender, curved and angled. Each side of the roof has a medium lilac leaf in font of it. The room over the hallway is the balcony/portal section. The portal section is built on inverted light stone grey slopes with a technic pin hidden in the middle. The sides of the portal are built with brick yellow bricks and bright yellowish green plates. Halfway between both sections of the brick yellow bricks and the bright yellowish green plates, there is a white brick with a hollow hole. A technic pin with a brick yellow cylinder and a brightly coloured cylinder plate goes on top. Each of the cylinders have a key inside them, the key matches up with the elemental colour. From left to right, top to bottom the order is a bright orange cylinder plate with a flame yellowish orange key, a bright green cylinder plate with bright yellowish green key, a medium lilac cylinder plate with lavender key and a medium azure cylinder plate with light royal blue key. Behind these bricks a 1x12 technic plate lays, to hold the portal. The portal is made up of several technic pins and technic pieces. Each piece has a strand of the portal coming out of it. The strands are transparent light blue curved slopes over white plates. They are connected by a brick with a hollow hole at the end. The exterior of the portal uses various brick yellow arch shaped bricks to create a circle. Above the circle there is the sky logo printed on a cylinder tile which sits on a 2x4 bright reddish violet plate. White wing pieces come out from the sides of it. Above it, a transparent bright bluish violet jewel is on display, in a hollow dark brown rod. Over the circle, is the roof, like the other roofs in the set it is curved, sloped and lavender with a medium lilac base. Like the other roofs on the top floor, the roof has a medium lilac leaf in front of each side of the roof. Bright purple and dark red leaf pieces are branching out from behind the roof. In the centre a technic pin and gear are hidden within light stone grey pieces. To further hide it, several warm gold tiles are over the pin. The pin is controlled by another pic directly above it. The pin is held and hidden by a brick yellow grooved cylinder brick. The grooved brick has a medium lilac top and bottom. If the cylinder brick moves, it moves the strand of the portal directly across from it. Due to friction and gravity, once the first strand is moved all the strands move. Each end of the balcony features a medium lilac slope and lavender fence connected to each other by a 1x6 bright reddish violet plate with a 1x1 round warm gold tile at the end. The centre features inverted light stone grey slopes with a 1x2 brick with studs on the sides in the middle. The side studs hold a 2x4 bright reddish violet tile which has a sticker of a winged design. The top of the balcony is built upon bright reddish violet curved pieces. It features a brick yellow arch in the centre with a curved brick coming out from each side. At the end of the curved brick a tile lays, facing the end of the balcony. The room on top of the spa is the study. The exterior and roof are the same besides the printed fire tile is now a water printed tile. The study features a brown desk built on a hinge. A letter sticker is on a 1x2 brick yellow plate, and it sits on the table. It is beside a quill in an accessory holder. On the right side a reddish brown tree with two branches is found. The first branch has a dark red leaf while the other has a bright purple leaf. A jumper piece placed on the tree, which is used to perch Nascha. There is also a balcony at the front which has a similar construction to the first balcony. It has a large medium lilac slope at each end. The balcony has a lavender fence piece in the middle. The three bricks are connected by a 1x6 bright reddish violet tile with gold 1x1 cylinder pieces at each end. A flower sits on the floor beside each end of the balcony. Emily Jones wears bright yellow shoes and sand blue shorts. Her sleeveless shirt is white with earth blue stripes, with an amulet printed over it. She wears an earth blue cape. Emily has bright green eyes, nougat lipstick and black eyebrows. Her hairpiece depicts reddish brown hair tied in a braid. Her accessory is a map of Elvendale with a picture of a silhouette of a key on it. Naida Riverheart wears earth blue sandals and a medium azure towel. She wears an aqua halter top with various printings in earth blue and silver metallic. Naida wears a light royal blue cape. Naida has blue eyes, light purple lipstick, black eyebrows and a medium azure crown. Her hair is aqua but bleeds into bright blue. She has pointed light nougat ears. Her accessory is her Transparent blue magic. Skyra wears a long white dress with warm gold printing. She wears a white top (with sleeves unlike Emily and Naida) continuing the printing from the dress. She wears a long medium lilac cape with a white feathered upright shawl. She has blue eyes, black eyebrows and nougat lipstick. Skyra has long lavender hair, light nougat skin and a warm gold feathered crown. Her accessory is a warm gold staff with transparent blue jewel. 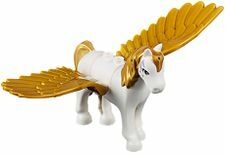 Golden Glow is a white Pegasus. She uses the horse mould introduced for the Friends theme. She has violet eyes and curved warm gold wings. Golden Glow has a warm gold mane and tail. On the left side of her neck, she has a warm gold spiral themed tattoo. Nascha uses a new owl mould. She is mainly white but has warm gold eyes, medium lilac eyebrows and a warm gold beak. In the top left corner of the box is the Elves logo with an earth blue background. Printed on the top right corner and on the right is the four elves- Aira, Azari, Farran and Naida. The elves are using their magic over Emily who is reading the map of Elvendale. In the middle of the box is a picture of the actual set. The background to the castle has a blue sky with large cumulus clouds. Amongst the sky there is various tall pointed mountains. On the bottom left corner is a picture of the four elemental keys. On the back of the box there is various pictures of the features of the set in squares over a sand yellow map of Elvendale. In the top left corner there once again like the front is the Elves logo. Underneath the logo is the set number. In the bottom left corner are the four elves and Emily with their names over them in the colour of their element. The bottom right corner shows Emily pointing at a tablet with an advert for the app underneath it. The top of the box in the left corner is yet agin the Elves logo. On the right corner is Naida in a border frame with the ratio 1:1 on the left of her head. To the left is the three mini-doll figures with the animals all lined up. 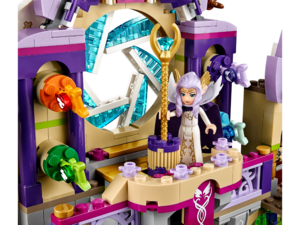 The set depicts Skyra going through her everyday life when she heard the five friends (only Emily Jones and Naida Riverheart in the set) having strawberry smoothies. The elves went to the castle with four elemental keys as they believed the portal will unlock and send Emily Jones, the human back home. The elves then used their magic to get through the entrance and up the lava staircase. The elves convinced Skyra to open the portal with the staff, which sent Emily home. After Emily went home the elves went to the spa section and befriended Skyra, who now writes them letters. The castle is much larger and worn down. Skyra was bitter after her sister died and did not upkeep the castle's exterior. Farran used his magic to open to rid the ivy off the walls, which allowed the five to enter. Azari went over the lava and used her fire magic to create a bridge, allowing the others to cross. When Skyra sent her Pegasus, Golden Glow to attack, Aira convinced her she was a friend not a foe. Skyra complimented the friends for getting as far as they did but refused to let them through the portal. Emily convinced her to let her through after giving a speech about why you shouldn't morn. Skyra found out Emily was her grandniece and the elf of heart. With the help of the elves Skyra sent her grand niece home, through the portal. At the time of the set's release the following parts were exclusive- Part 14769 in aqua, Part 40243 in bright reddish violet, Part 6179 in bright reddish violet and in flame yellowish orange, Part 3029 in bright yellowish green, Part 3039 in bright yellowish green, Part 15535 in dark green, Part 21409 in earth blue and light royal blue, Part:30565 in flame yellowish orange, Part:50950 in lavender, Part 13731 in lavender, Part 15068 in lavender, Part 19121 in lavender, Part 3032 in lavender, Part:3623 in lavender, Part 3069 in lavender, and Part:87079 in medium azure. Skyra, Nascha and Golden Glow are all exclusive to this set. This is a description taken from LEGO.com. Please do not modify it. 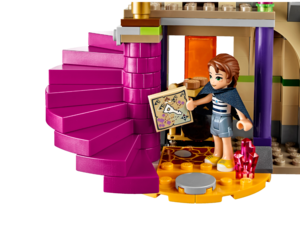 (visit this item's product page) Complete the Elves’ epic adventure and send Emily Jones home through the magic portal! Find the magic portal to send Emily Jones back to the human world! 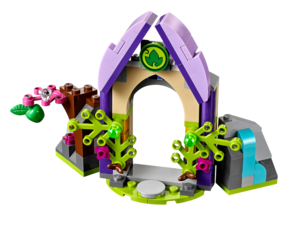 The LEGO® Elves have completed their quest to find all 4 magic keys needed to open the portal. 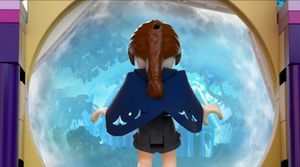 Now Emily and Naida Riverheart, the Water Elf, must make their way through the obstacles in the amazing Sky Castle to reach the portal while Skyra, the guardian of the portal, watches on from above with her owl, Nascha. Help the elves make their way through the overgrown entrance and use Naida’s magic water powers to find the secret door in the spa behind the waterfall. Then reveal the enchanted staircase to get past the lava kitchen and overcome Skyra’s protective Pegasus, to place all 4 keys into the portal. When you finally face Skyra, convince her to open the portal using her staff. 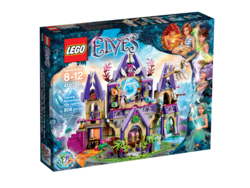 Who knows when Emily will visit the incredible universe of the LEGO Elves again! Includes 3 mini-doll figures: Emily Jones, Naida Riverheart and Skyra, plus Golden Glow the Pegasus and Nascha the owl. Use the magic keys to open the portal and send Emily Jones back to the human world! Facts about "41078 Skyra's Mysterious Sky Castle"
This page was last edited on 13 March 2018, at 19:48.